THOUGH most of the residents of the sleepy seaside town of Iria, in the Peloponnese's Argolid region, may not know it, they are riding the first small crest of Greece's long-anticipated photovoltaic (PV) energy production wave. Instead of artichokes or lettuce, solar energy is being harvested on a 3.5km2 plot in Iria's bustling fields by industry newcomer Kadet Inc, which set up a 98 kilowatt (kW)* photovoltaic station there this past summer. 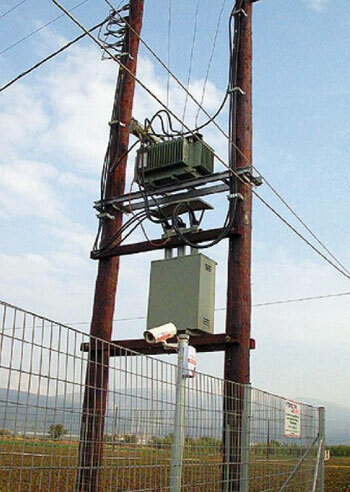 The high-tech, single-crystal panels guarded by surveillance cameras and connected to a Public Power Corporation (PPC) column are in sharp contrast to the agricultural activity surrounding them. But, like Greece's increasingly common wind turbines, they may be a reflection of the future. The photovoltaic station opened in September, though a few final touches remain. It provides the PPC daily with enough energy to cover the needs of 11 to 40 residences. According to the Independent Electricity System Operator (DESMIE), Greece's energy transmission organisation, 130 photovoltaic producers are currently providing energy to the national grid. Most are small, like the Iria solar park. In September, DESMIE counted 6.3MW of PV power feeding into the energy grid from these producers, up from 890kW in January. Haris Lazanis, head of DESMIE's renewable energy department, estimates this will reach 10MW by the end of the year. This is a modest start considering that a single wind turbine can produce 3MW. All but one of these new PV parks are under 100kW in capacity size. Only company Sunenergy has a large system, the 944 kilowatt (nearly 1 megawatt, or MW) plant in Kilkis, northern Greece. Yiannis Nikolatatou, of the photovoltaic section of The Centre for Renewable Energy Sources (CRES), believes that while Greece may not reach the Regulatory Authority for Energy's (RAE) goal of 600MW of PV capacity by 2010, it will do so soon afterwards. The World Wildlife Fund's (WWF) Achilleas Plitharas believes the ministry of development has made renewable energy a priority and has reasonable expectations about PV energy. He says this may be the end of get-rich-quick dreams for PV energy in Greece, but adds: "We are still very far behind …. There's been a big delay." Producer permits from RAE are required for PV structures over 150kW. Exemptions from production permits are needed for smaller parks wishing to sell solar energy. After a great interest in photovoltaics (due to a 2006 law's advantageous feed-in tariff rates and generous subsidies), things slowed down as RAE was flooded with over 7,000 PV production applications. So far, RAE has granted 51 production permits (equivalent to 111MW) for the mainland, as well as 1,086 (or 113MW) exemptions from permits. Though southern Greece has the solar edge (with 10-15 percent more annual sunshine than northern Greece, says Nikolatatou), most of the country's PV stations are located in northern and central Greece and the Peloponnese. RAE says that while nearly 3,000 applications have been submitted from Crete and other islands, there are no production permits, just 1,135 exemptions (or 83MW). 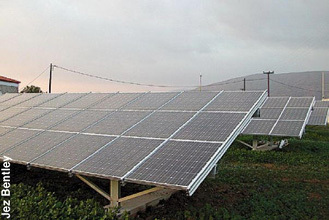 Lazanis says that it's relatively easy for PV producers - technically speaking - to connect to existing rural electricity grids due to the plants' small size and low voltage. But even a small park like that in Iria required 18 months to acquire the proper paperwork from 10 different state authorities, Kadet Inc noted. Nikolatatou thinks the paperwork, particularly concerning environmental requirements, will become easier with time. He notes that permits are usually granted for barren land located near energy lines with road access. Many investors' plans were put on ice in July when the ministry of development - in an aim to plough through the backlog and rein in future spending - proposed a 57 percent decrease by 2014 in the current feed-in tariffs. The 400-500 euro per MW/hour rates are up to 6 times higher than that of cheaper-to-install wind power turbines. However, on November 4, a proposed draft law was submitted to the government council by Development Minister Christos Folias calling for a smaller (11 percent per year) decrease in prices, starting in 2010 before stabilising in 2014, with a 20-year price guarantee. Stelios Psomas, an advisor to the Hellenic Association of Photovoltaic Companies, says photovoltaic producers are waiting for the law to pass to judge it. "The law may offer favourable prices, but it may introduce some new obstacle," he explains. Currently, Greece has the highest PV feed-in price in the eurozone, notes engineer Christos Koutalas, whose company installed the Iria station. The station's investors estimate it will take seven years to see returns on their solar investment. Much larger PV parks on the drawing boards include a 50MW PV park in Megalopolis, Arkadia. But the WWF's Plitharas thinks it's ill-advised to focus on big solar farms. He points out that wind power is more cost- and space-effective. He believes the ideal is a combination of solar, wind and other renewables that supplement each other depending on weather conditions. Koutalas notes that another advantage of PVs is that, if installed on a small scale around the country, they can cut down on PPC's energy transportation costs, which he says reach 7-9 percent. Plitharas notes: "The issue is how to put [photovoltaics] into our houses, which is not being discussed." Currently, individuals are discouraged from PV investments in their homes because they must register as businesses to sell solar energy to the PPC. He believes that there should be tax breaks and a one-stop-shop for licensing. Photovoltaics have immense educational benefits, he adds. "If you produce [energy] yourself, you consume less."